Why Do Property Managers Use Property Management Software and How Do They Work? Being a property manager is a lot of work and requires keeping records of a lot of different things. You have to keep track of vacancies, log repairs, make sure every tenant has paid. You also must list properties on various rental websites, and do a lot of other accounting related tasks. This is a big job, but some property managers choose to employ a property management software solution. Traditionally property management software has been an in-house software that has either been designed specifically for the company using it or has been designed by a third party and installed on a company server. Now, cloud-based solutions are becoming more popular. These types of software help the property manager do a number of different things from accounting tasks to advertising vacancies. Some software even provides some services for property owners and for tenants. Accounting: The software can keep track of all profits brought into the company, how much is paid out to vendors, contractors, and the property owners. This information can be combined into reports to help the company with record keeping and tax purposes. Rent Tracking: The software can be used to keep track of what rent is owed, what has been paid, and what is delinquent. Any discrepancies can be quickly addressed. Listing Vacancies: Some software has the ability to help list any vacant rental units on sites like Zillow or Trulia. Some even create custom websites for listings to help search engines find them. 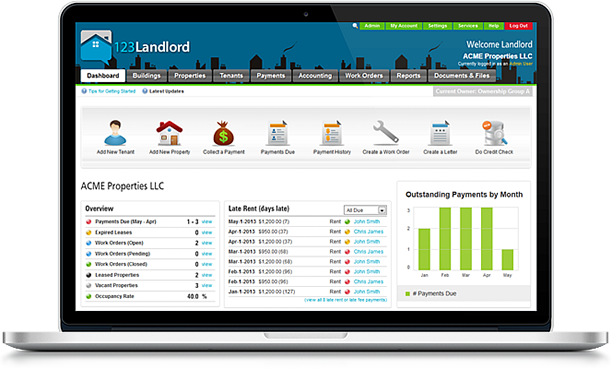 Tenant Services: The property management software isn’t just helpful for the company. Most of the available software also has features that make it convenient for tenants as well. Renters can pay their rent online even using a credit card. They can easily report damages to the unit and request repairs all from the comfort of their laptop or smartphone. Property Owner Services: The software can also provide some tools to help landlords keep track of the information they need. An owner can quickly see what properties they have vacant, if rent has been paid or not, and if any maintenance has been performed. These things can also be combined into a report for the landlord’s records. This can be especially helpful during tax season. As you can see, property management software can do so much more than a simple spreadsheet.